President of the Karachi Chamber of Commerce and Industry (KCCI) Shamim Ahmed Firpo has urged the authorities to speed up various ongoing infrastructure development projects pertaining to construction and rehabilitation of roads as the citizens have been facing immense hardships and constantly complaining about severe traffic jams at some of the busiest roads of Karachi. S. M. Muneer, Chief Executive of Trade Development Authority (TDAP) has formally inaugurated three-days 3rd Pakistan Mega Leather Show, 27-29th January’2017 at Lahore Expo Centre, today while officially it will be inaugurated by Khurram Dastigr khan, Federal Minster of Commerce tomorrow. In a press release, K-Electric has out rightly rejected recent media news with reference to any claims of excessive collection and labelled the same as wrong interpretation of the tariff mechanism. The utility has further stated that the consumers have been charged as per approved tariff without any anomaly. 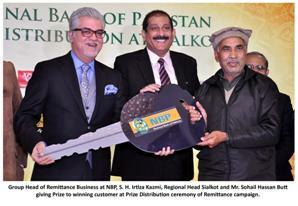 A Prize Distribution Ceremony was held at Sialkot where National Bank of Pakistan distributed prizes to its Remittance Customers who used NBP’s services to receive their remittance payments through legal channels. The Prizes included Motor Bikes, LCD TVs, Gold Bars, Laptop Computers and many other gifts. (IAMKARACHI (IAK) and TPL Maps, Pakistan’s first digital mapping solution, part of TPL TRAKKER Limited (TPLT) signed an MOU at the Centre point, signaling the commencement of a partnership aimed to enrich the culture and physical spaces of Karachi, Pakistan. This MOU was signed by both parties to put the IAK Walls on the map, literally. Shaheen Air International (SAI) has been conferred with two top honors at the seventh edition of Brands of the Year Award 2016. The airliner has been awarded Brand of the Year Award for 2015-2016 in the Airline Category, while it has clinched Brand Icon Award for 2015-2016 in the same category. The United States Association for Small Business and Entrepreneurship (USASBE) named IBA Karachi’s Women Entrepreneurship Program the recipient of the 2017 Outstanding Specialty Entrepreneurship Program. USASBE is internationally recognized as the premier association for entrepreneurship education and has ranked entrepreneurial programs since 1990. President of the Karachi Chamber of Commerce and Industry Shamim Ahmed Firpo Monday attended All Pakistan Chambers’ Presidents’ Conference held in Bhurban which was hosted by Rawalpindi Chamber of Commerce and Industry. A group was photo taken on the occasion of a symposium for educators organized by Oxford University Press (OUP) on 15 January 2017 in Dubai. Based on the theme ‘Maximising Learning Potential’, the event showcased the textbooks, supplementary readers, and digital resources published by OUP China, India, and Pakistan for all Indian, Pakistani and Arabic medium schools. President KCCI Shamim Ahmed Firpo, led a delegation of Karachi Chamber of Commerce & Industry (KCCI), to meet with Consul General of Thailand in Karachi, Suwat Kaew Sook and discuses the forthcoming 14th My Karachi Exhibition in order to seek Thai companies’ participation in the event.